On the night of December 13-14, 2017, the annual Geminid meteor shower peaks this month to grace the winter night sky with ‘shooting stars’. This shower is easily one of the best of the year to observe producing bright meteors and average rates of up to 120 meteors per hour during the peak. The meteors are not your traditional remnants of a comet, they originate from asteroid 3200 Phaethon. It is thought that the asteroid collided with another object many years ago to cause a stream of dust and rock around its orbit. For this reason, this particular shower has been known to produce occasional bright fireballs. The Earth passes through the orbital plane of this 5 kilometer space rock during December causing some of these tiny pieces of rock and dust to enter the Earth’s upper atmosphere and burn up causing the meteor shower. This year, the Moon will rise as a slender crescent not until the early hours making for good meteor viewing for most of the night (weather permitting). 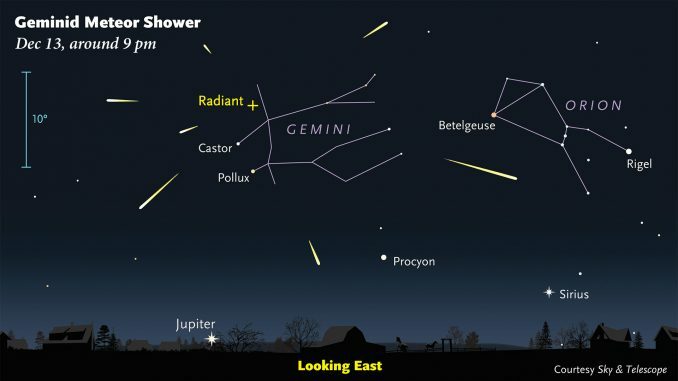 The Geminids begin their streak across the sky from the constellation of Gemini as shown in the illustration above, however please read on to find out the best way to observe the light show. Gemini is not the place in the sky to look! The constellation of Gemini is located to the left of Orion and rises in the North East just as the sun is setting. This means that the Geminids can be observed during convenient hours as soon as the sky is completely dark. Any time after 8pm local time would suffice wherever your location in the northern hemisphere but the later you observe, the higher Gemini will be in the sky increasing the rates of visible meteors. As the meteors are visible to the naked eye, no special equipment is needed other than your eyes! A common mistake is to find the direction of the constellation of Gemini and concentrate on that area on the north-eastern sky. This is not the best way to observe them. The meteors start there journey from here but then streak across a large part of the sky so you are actually more likely to catch them in other parts of the sky as they suddenly brighten. The best method is to get a reclining chair and lie down flat so you can see as much of the sky as possible. Keep plenty of layers on and wear a hat. December nights can quickly become bitterly cold after sunset, especially when not moving around much!